Auckland racewalker Fan Zhou is on a mission to get more Chinese athletes competing in Kiwi marathons. New Zealand hosts some of the world’s most renowned running events and Auckland travel agent Zhou expects “running tourism” to get more popular with Chinese visitors. At 54 years old, Zhou herself is an accomplished racewalker, having participated in the Auckland and Waiheke Island half marathons. Next month she will take on the 21.1km New Zealand Sotheby’s International Realty Queenstown Half Marathon for the second time and embrace the new role of athlete ambassador for the premium real estate brand. Almost 100 Chinese are registered to race this year so far, consistent with last year’s number. 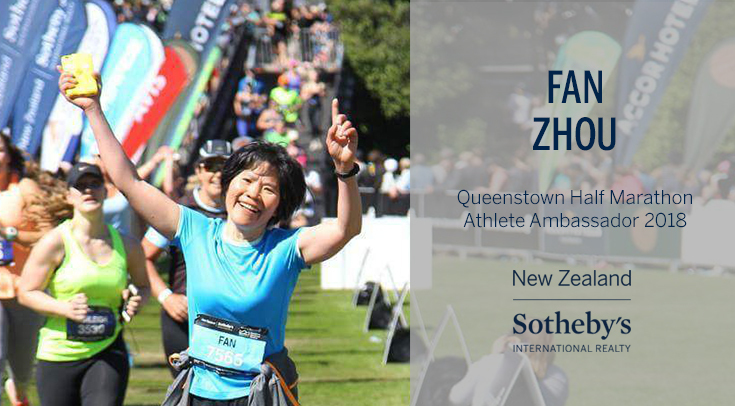 Zhou won the Walker 50-59 Years category in the New Zealand Sotheby’s International Realty Half Marathon last year with a time of two hours, 30 minutes. It was an impressive result for the mother-of-two, who only started competitive walking three years ago and completed her first official event – the Auckland Half Marathon – at 52 years old. Now she hopes to beat her time at this year’s sold-out Queenstown race on Saturday, November 17.